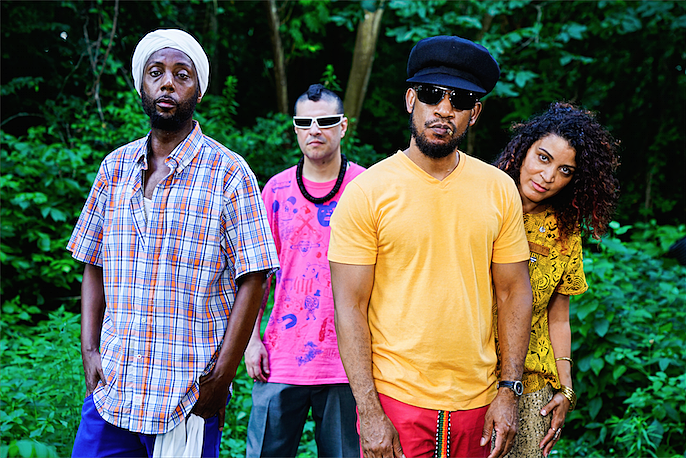 While the Digable Planets reunion treks on, that’s not all the members are up to this year. Butterfly is busy with Shabazz Palaces, and Ladybug Mecca is part of a new collective called BROOKZILL! (“Brooklyn meets Brazil”). It’s with fellow New York hip hop innovator Prince Paul (who, among other things, you know from producing De La Soul‘s classic debut), Don Newkirk (who appears on that same De La album), and Brazil’s Rodrigo Brandão. The group’s debut album, Throwback to the Future, which is due October 7 via Tommy Boy Ent (pre-order), is aiming to pull from both hip hop and Brazilian music, and was born out of Prince Paul’s trip to Brazil a decade ago, when he met Rodrigo Brandão. “I saw very early on the connection between the Afro-Brazilian experience and hip-hop, between breakbeats and what they play here in the tambor drums at the Candomblé ceremonies – the spiritual rituals, the drums and the chanting,” Brandão told Rolling Stone. The album features a few other classic underground hip hop staples, like Del the Funky Homosapien, Count Bass D, Kid Koala and Mr. Len, plus Gil Scott-Heron collaborator Brian Jackson, and a handful of Brazilian artists. We’re premiering “Saudade Songbook” off the album, which features Count Bass D and samples the Brazilian song “Taieiras.”. If you’re into any of the music mentioned so far in this post, you definitely should check this out. It’s right up the alley of that kind of adventurous late ’80s / early ’90s New York rap, and it sounds forward-thinking today too. Throwback to the future, indeed. The song is “a celebration of loved ones who have passed on from this world to the next. We honor their life and their impact on our lives in a song that lifts them up, as I know that they still walk with us at every moment,” Ladybug Mecca tells us. Listen, and check out the album’s tracklist, below.